We are members of The Siberian Husky Club of America, Siberian Husky Club of Canada, Yankee Siberian Husky Club, and The Champlain Valley Kennel Club. We actively show our dog in conformation and Rally Obedience in the USA and Canada. We currently only harness our dogs for pleasure. We are located near Jay Peak Ski Resort about 2 hours from Montreal and 4 hours from Boston, also near picturesque Lake Memphremagog. For information on current litter plans or photos of past litter please visit our "Puppies" page. Enjoy the information we have on our site. 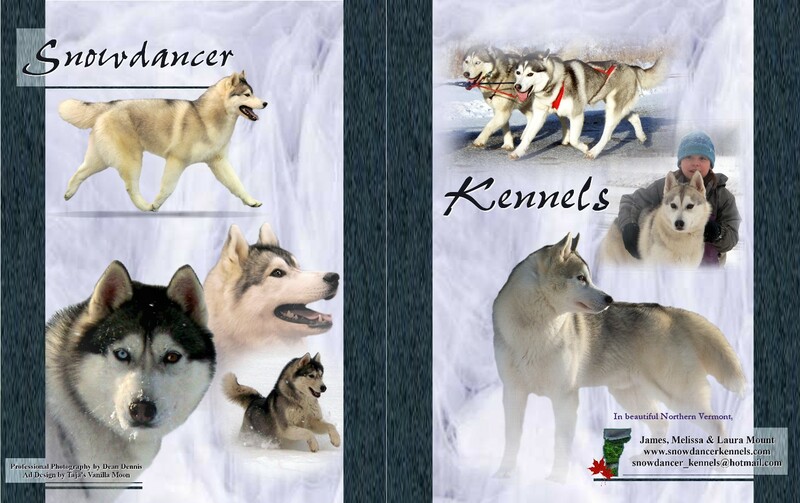 Please email us at snowdancer_kennels@hotmail.com for more information. Don't be fooled by websites stating their puppies are as good or better quality than most in the area. They tend to always have puppies available. That is all but a puppy mill. We only breed when we are wanting to add to our kennel. If they don't show you don't know how close to a correct Siberian you have. A wooly is an incorrect coat and they collect snow and get matted. We also do not require you to feed special vitamins for your health guarantee to be valid.